NorthStar slab rollers are made in two series: Standards (used by hobby potters and students everwhere) and Supers, which are right at home in industrial, production and institutional settings. The Standard machines are built at 18" and 24" wide. Their rollers are 2-1/2" in diameter, and the tables measure 48" long. The Super machines are much heavier: the tables measure 72" long, the rollers are 4" in diameter, and they come with wagon wheel handles. The machine pictured at left is a Super slab roller. Bodies and rollers for both series are made of cast, machined, high-strength aluminum alloy. Gears are made of either nylon or steel, whichever is strongest for that particular application. Tabletops are made of moisture-resistant Medex with melamine surfaces. All metal surfaces are either zinc-plated or coated with a durable powder coat finish in NorthStar's distinctive blue. Virtually no maintenance is required, beyond keeping the machines clean. All NorthStar slab rollers have two rollers, much like the wringers of old-fashioned washing machines. The handle turns the bottom roller, which cannot move vertically. As the bottom roller turns, it drives the top roller through a train of gears. 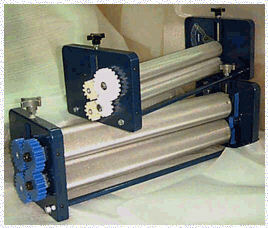 The upper roller turns, and can be adjusted either up or down for slabs of any thickness from paper-thin to 2" thick. A wide variety of other texturing materials and objects can be passed through the machine along with the clay. 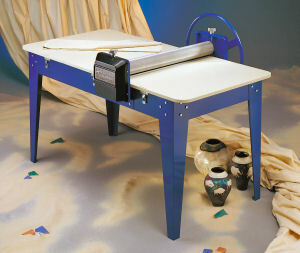 The Porta-Roller was designed for home and studio clay artists with limited space and teachers who move between multiple classrooms (or schools). The rollers are 18" wide, with two "tabletops" that measure 18x24". Slabs from the Porta-Roller can measure anywhere from paper-thin to 2-3/4" thick and 16" wide. The North Star 24" Standard slab roller redesigned with a set of Table Toppers for a little more width than the Porta-Roller. The two rollers turning together pull slabs through easily, and the vertical adjustment of the top roll gives an easy-to-set and infinitely adjustable thickness from paper-thin to over 2 inches. A reference scale allows setting and repeating openings to within 1/100 of an inch. Here you get great flexibility in making slabs from very thin, translucent porcelain slabs to thick, heavily textured architectural slabs with ease. Slabs can be rolled either direction or reversed on all North Star machines. These Standard slab roller packages include the standard slab rollers specified above, plus a worktable 4' long, wagon wheel handle and canvas for the worktable. These Super slab roller packages include the standard slab rollers specified above, plus a worktable 6' long, wagon wheel handle and canvas for the worktable. provide the work surface on the frame of the NorthStar worktable included in the slab roller packages. Made of moisture-resistant Medex with a melamine surface, they're very tough and durable. Available in two sizes to fit the most common NorthStar slab rollers. for the NS550 is made of 3/4" Medex with high pressure melamine overlay, in two sections supported by steel rails all around. Installing the shelf requires drilling, but no disassembly of the slab roller or worktable. Precision drilling template and all hardware are furnished. This shelf can support 600 pounds. may be just what you need if you work large and want more workspace! They come in two flavors, with or without a hole sized to fit a 5-gallon plastic bucket (or the included 15" plastic throwing bat to close the hole when you're not using it). The extensions fold down against the legs when not in use. Wings measure 24x24x3/4" and can support up to 100 pounds each.